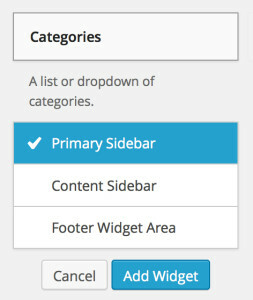 The WordPress Widgets module has been completely redesigned in the new Version 3.8 release. As I was updating the 2nd Edition of my top-selling Winning with WordPress Basics for this new release, I discovered something about the Widgets module that I hadn't seen anywhere else (Or maybe I just missed it). You no longer have to drag and drop a Widget to a widgetized area to use it. There is a much simpler method for assigning a widget to a widgetized area—simply click on the widget to reveal a widgetized area assignment menu. From the menu, click the widgetized area you want the widget to appear. A check mark appears next to the widgetized area name. Then click the Add Widget button. The widget is added to the selected widgetized area and all that's left to do is configure the widget as you normally would.